I am a member of Blogging for Books. Every so often, they send me an email of several book titles. If i am interested in reading one of them, i let them know, they send me a complimentary copy, and I do a review on my blog in exchange for the free book. Waterbrook Multnomah Publishers is a christian company, and they often have books i would want to read anyway. I recently got an email from them, and I was thrilled to see THE BEST BOOK EVER as one of the books I could review! Do you know what that book is? I am sure many of you are thinking, "Well, the best book ever is Redeeming Love." Because it is. Anytime, anywhere, you hear a conversation on favorite books, this book will be mentioned. Because it is THE BEST BOOK EVER. 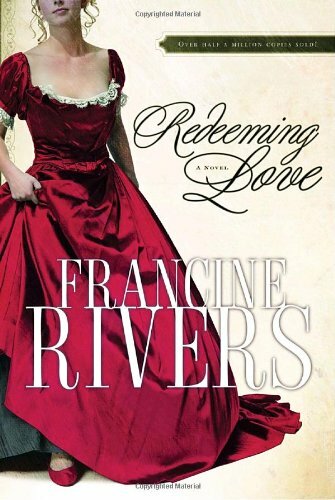 "a story of love that won't let go - no matter what"
Before Francine Rivers became a christian, she was an established romance novelist in the general market. When she became a christian, she was about to write another one, when she felt as though God was taking her writing in a different direction. And then she felt He was leading her to write a book on the book of Hosea, from the Bible. A fiction version, of course, but based on the story of Hosea. For those of you who don't know the story, in the Bible, there was a godly man named Hosea. God told him to marry a prostitute. And so he did, out of obedience to God. The story Redeeming Love is a fictional account based on that story. And it is beautifully told. Very well written. Just... I can't say it enough. It's a wonderful book. I feel that, no matter what your religion is, you will love this book. Even if you don't believe in God, you will appreciate it as a beautiful piece of fiction. But to read it while keeping in mind that it is supposed to be a representation of how much Christ loves YOU... well, that makes it even more beautiful. Redeeming Love is fiction, yes, but it still ministered to me, and gave me a picture of the love Christ has for me. I already own this book, which means... I am giving away my new copy! There are several ways to enter, as you can see below. If you have already read this book and just want it on your shelf, enter this giveaway. If you have already read it, but have someone in mind that should read it, enter this giveaway. If you feel like passing on this giveaway because you don't really like to read, enter this giveaway anyway (you will like this one, I promise!). And if you love to read but have never read Redeeming Love, definitely enter this giveaway! Even if you don't win this giveaway, please consider purchasing your own copy. It is fantastic, I promise! I also have to tell you that I have read all of Francine Rivers' books, and they are ALL fantastic. Redeeming Love is my favorite. The Last Sin Eater is a close second. But they are all very very good. The contest ends next Saturday, August 24th at midnight. I will announce the winner sometime Sunday. Good luck! Redeeming Love IS the best book ever!!! OMG!!! I already own it and totally need to re-read...I cry like a baby every time!! Oh my, this really is the best book ever! I'd love to win this to share with a friend who would love it! I have to agree that Redeeming Love is the best book! I have only read it once, but it is one that I'm sure I could read again and again. I keep hearing great things about this book, and even though I tend not to read a ton of Christian fiction, I'm really intrigued by it. Definitely would love to win a copy and finally have a chance to read it. Ahhhh! One of my faves! I'm not entering because I own a copy and I don't want a good copy to be shelved since I can't think of who I'd give it to. Yay for great books! THIS IS SERIOUSLY one of the best books ever! I am entering because I have checked this book out of the library at least a dozen times! One of my favorite books ever! I've read it three times and could read it another 300! YES! This is the best book ever. I have read it cover to cover so many times I can't count, and each time I cry like a baby!!!!! I have heard so much about this book but I have never read it! I would love to. I need to read this book! I've heard great things about it! OvuSense Review Part 4: Does It Work? I'll just worry about my classroom.